The Algerian desert floods of solidarity with the epic race for the Saharawi people. – The basque María Elena Frechilla gets a well-deserved triumph in the women’s category, in front of the swedish and the spanish Hannerz Begoña Beristain. – The andalusian Rafael Ángel Gómez and catalan Meri Bonet are first in the half marathon. Smara (Saharawi Refugee camps, Tindouf – Algeria) -The Sahara Marathon is a race of heroes. The majority are anonymous. As the german Wolfgang who every year, with a group of his countrymen, comes to run this ordeal, despite his 76 years. As the Bolivian Ovidio, whose diabetes does not prevent him to face the race in the desert. Like Mohamed, the Saharawi runner who lost a leg in the explosion of a mine, but despite this took part in this race to claim the struggle of his people. A total of 455 runners have crossed the desert with their solidarity and flooded the saharawi refugee camps with their help and their support to the saharawi families who have been living far away from their country for 42 years. It was a tough but exciting race. The high temperatures of the desert and a strong wind made the participants of the 29 countries present to suffer a lot. And among the heroes came down a world champion, the italian Giorgio Calcaterra, three-time winner of the World Cup Ultramarathon, who fought like the champion he is to the victory. It has been a triumph of tactic, started from the formation of a group of five runners in the first kilometers. Soon Vicente Grande Duque, winner of the last edition, begun to put distance between himself and his rivals Calcaterra and Jon Salvador (two-time winner in the same race). The fate seemed to be written, but the Algerian hammada can punish you when you least expect it and Calcaterra took advantage and attaccked in the final part of the race to recover the distance Grande Duque was losing, suffering from muscle pain. Even Salvador, for a contracture at the halfway of the race, could not repeat his triumph, though both have ended the race happily in order to be on the podium next to a world champion. Even the women’s competition has been a beautiful race, where the basque athlete Elena Frenchilla won over the swedish Sara Hannerz and the basque Begoña Beristain. 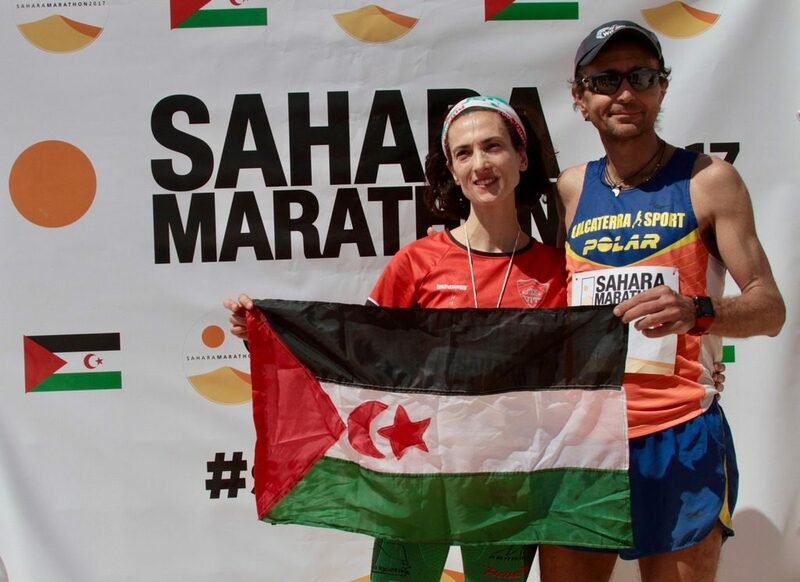 The SaharaMarathon is other distances too, where the representatives of Spain, Algeria and the Saharawi Arab Democratic Republic shared the winnings. In the half marathon the andalusian Rafael Ángel Gómez fought hard with the algerian Met Chat to gain an undisputed triumph in the last kilometers. Among women, Meri Bonet, Eve Arévalo and Marisa Guillen gained three places of the podium with a very fast race. In the 10km test the winners have been the saharawi hero Amaidan Salah and the spanish Gala Mora, and in the 5km Roberto Gracia and the local Nasrala Salem. The delegation of nearly 500 people who participated to this race stayed in the camps for the rest of the week to start the dozens of projects of solidarity that the SaharaMarathon supports, such as humanitarian aid and day to day life with the saharawi families.